The pupils were very excited this term to meet Gary the Gecko when he arrived to join our growing range of school pets! Gary was donated by the friend of one of our support workers and the children were quickly fascinated by his diet of locusts and crickets and the fact that he sheds his skin. Pupils take turns to feed Gary and check that he has enough water. They also monitor the temperature of his tank and help to keep his living space clean for him. The children love to ‘call’ for Gary at break times and place him on their hands where they can stroke him. Geckos enjoy the warmth of human body heat, so he is quite happy to sit on our hands and have his head rubbed. 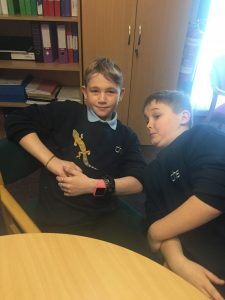 Having Gary in school is another great way to teach our pupils about caring and nurturing in relation to a range of living creatures that depend on us for their well-being. 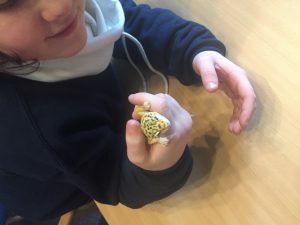 Having the responsibility of feeding and caring for a reptile has not only taught our pupils about a new type of species but also helped them to understand the diverse range of needs and requirements for the many creatures that exist in our world.